One of the hardest challenges for retailers is achieving a balance between estimated sales and actual sales. Getting it right will generate more profit, while getting it wrong can drive any business to the edge. Overestimating sales forecasts is one of the biggest contributors to wastage, and nowhere is this more apparent than in the food industry. Recent research (Food and Agriculture Organization of the United Nations report) estimates that over one third of food produced for human consumption is wasted per year. Brand damage and loss of customers who are dissatisfied with the poor service and lack of stock. 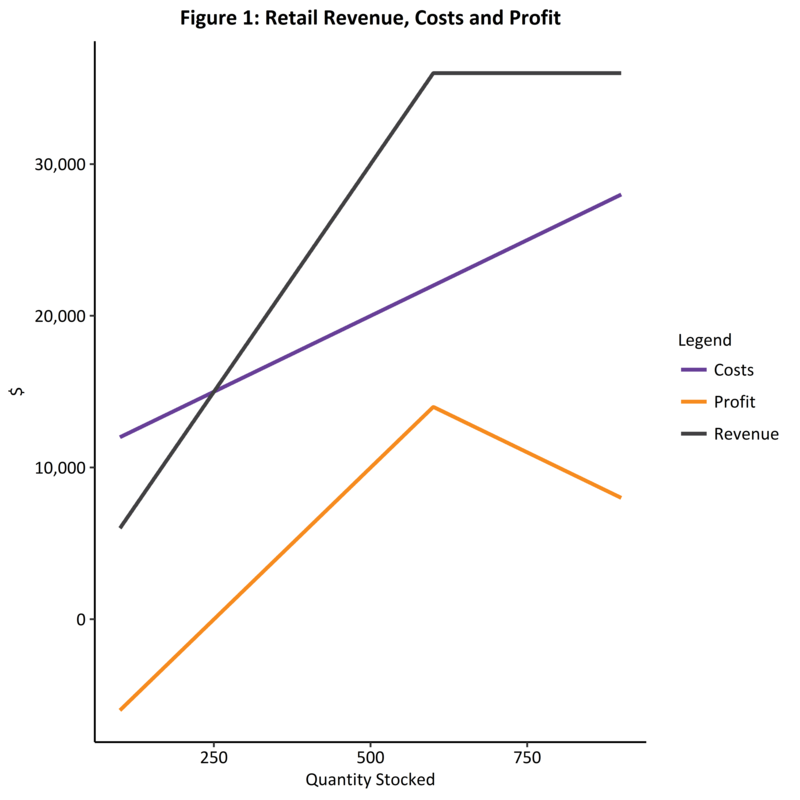 The example in Figure 1 shows how over or underestimating sales forecasts can have a wide ranging effect on a retail business. In this case, let’s say our fixed costs are $10,000 per week. We buy each item for $20 and sell it for $50. And let’s assume the actual demand is for 600 per week - we would never know this in advance, but it helps demonstrate our point. The number of items we stock will determine our profit. If we stock 400 items, our profit will be $6,000 for the week. The optimal profit is made when our supply matches demand perfectly (as if that ever happens!). In this case it would be $14,000. But if we have too much stock, our profits will decline. If we stock 800 items, our profit would reduce to $10,000, assuming the extra items were unsold or wasted. The table below shows the difference between optimal profit and actual profit, depending on what your stock levels are to meet demand. This is a simplified example, but it shows how being more accurate in your forecasting of sales demand and stocking requirements enables you to increase profits. In a perfect world, demand would remain constant every week. Unfortunately it’s not that simple. If you think back to elementary economics, this is what supply and demand curves are all about. The demand curve is constantly changing. If it starts to rain, a retail store can expect a downward shift in demand and a drop in sales (unless you’re a home delivery pizza business). 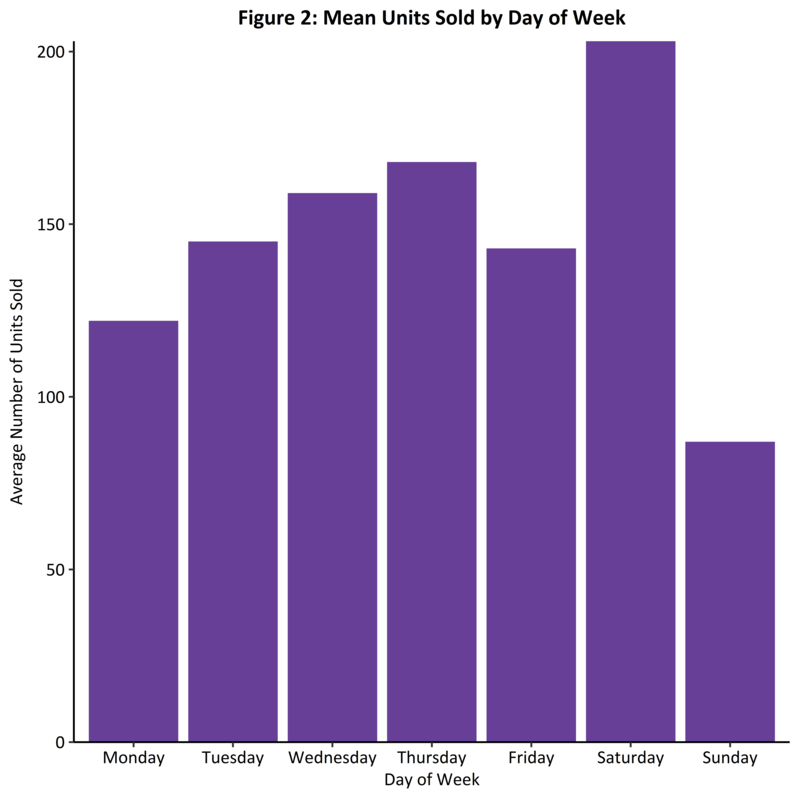 Likewise, the demand curve on a Tuesday is different to a Friday, and a sunny Tuesday is different to a windy Friday. Making a perfect prediction of sales volumes is virtually impossible. But you can certainly ramp up your forecasting and gain a clearer picture of how much stock you’ll need if you have a better understanding of the factors that influence demand. Record and track the information. Do whatever it takes to capture it. Microsoft Excel or Google Sheets are a good start. A friendly geek with database skills is even better! The example above is a simple case of examining one influencing factor at a time, but we have seen businesses lift the accuracy of their sales demand forecasting by 5-10% using this technique. We recommend it as a way of dipping your toe in the water to see the difference even a small forecasting improvement can make to your bottom line. Another potential way to begin experimenting with data-driven forecasting is to have a play around with our free Excel forecasting tool - it's designed to take your data and provide you with charts and tables showing how different variables have historically impacted your sales and/or changed over time. Of course it’s unlikely you’ll be selling just one product as per our example. The situation becomes vastly more complex (and the value of forecasting more apparent) if we now stock 600 items, spread over 20 product lines, in different sizes. And imagine what it’s like when you’re dealing with multiple stores! Looking at combinations of factors influencing sales demand in this type of scenario is a different challenge altogether that calls for more sophisticated analytical skills and forecasting methods (e.g. statistical modelling or machine learning). With this more complex analysis, you can expect more accurate and robust predictions. Our focus in this article has been on retail, but the same kinds of issues occur across the board in other business sectors. On a scale of 1-10, how good are you at estimating what your demand is going to be for a given time period? What factors do you intuitively (or analytically) use to work out the likely demand? How much does getting your forecasts right keep you awake at night?